Early next year Intel will be launching their touted Kaby Lake series of chips to the desktop, and while the CPUs are very ‘business as usual’ in their number of cores and threads, they do sport clock speed improvements and a shiny new platform to tempt Skylake or Haswell users into an upgrade. But, perhaps the most interesting of the chips isn’t the new I7-7700K or the I5-7600K, but instead their little brother, the I3-7350K. It’s the first I3 CPU Intel have ever offered to be multiplier unlocked, meaning for users with less disposable income (or looking to put together a budget gaming rig for LAN gaming) this new CPU might well be just the ticket. Intel have equipped the I3-7350K with 4MB of Level 3 cache, and not only is it multiplier unlocked (as noted by the ‘K’) but comes out of the box at a pretty darn impressive 4.2 GHZ. 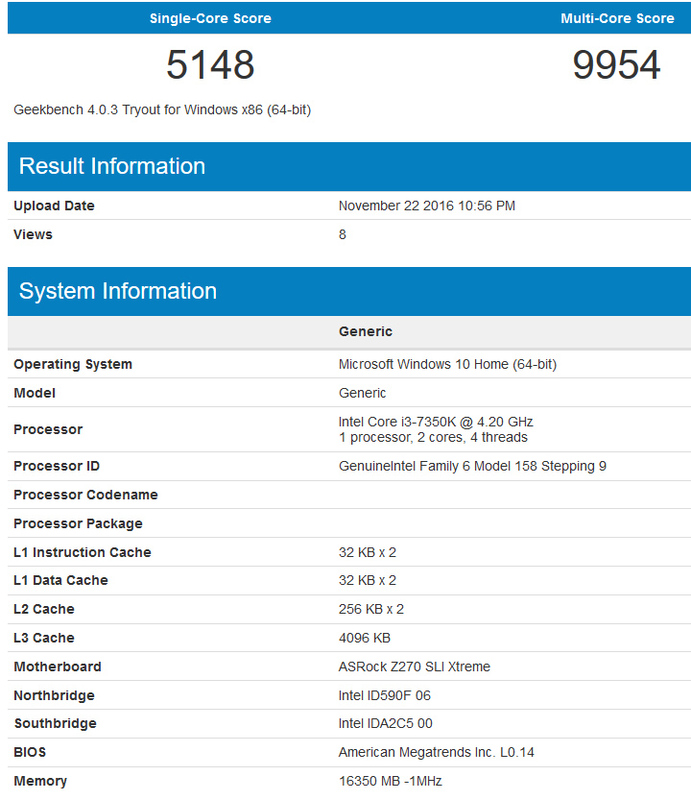 These clocks allow the single threaded performance of the little Kaby Lake which could to scream past the 5K mark in GeekBench 4, scoring an impressive 5148 in single thread, and 10048 in multithreading. Naturally these CPU’s are also fully equipped with Intel’s HyperThreading technology, so technically the CPU is fully capable of handling 4 threads at a time – but naturally these ‘hyperthreads’ aren’t quite at providing the same performance as traditional full core, but will be a tangible boost in applications which make use of them. Current pricing rumors for the chip put it around the $177 US dollar mark, around 60 dollars cheaper than a Kaby Lake I5-7600K (which comes with an extra 2 MB of cache and four physical cores, but runs at the same clock speed). Considering the Skylake powered I5-6400 scored just 3686 in single thread (thanks to the anaemic clock speeds) and even the I7-4770K would score just about the 12K mark in the same benchmark with multi threading shows these CPU’s are extremely potent. It’ll be curious how overclocking fits into the mix. Given the I3-7350K is currently running at ‘just’ 4.2Ghz, a clock speed of even 4.7 or 4.8Ghz will provide enough performance to drive a budget to mainstream graphics card fairly easily. Intel are in a very curious position with Kaby Lake – not because it’s a bad processor, but because what it offers is so predicable. Most of the excitement is really on AMD right now, and it’s down to the two companies to tempt users into upgrading in anyway they can. With any luck Intel 200 series of boards will have a few nice budget overclocking options, allowing users to put together a nice bang-for-buck system using the I3-7350K as the CPU of choice, and then possibly springing for a faster processor down the road. The only issue with this (as said) is Zen, and with rumours the Zen SR7 (featuring 8 cores, 16 threads) will cost just about the $300 US dollar mark, it’ll be a very interesting time when both companies are at each others throats next year. 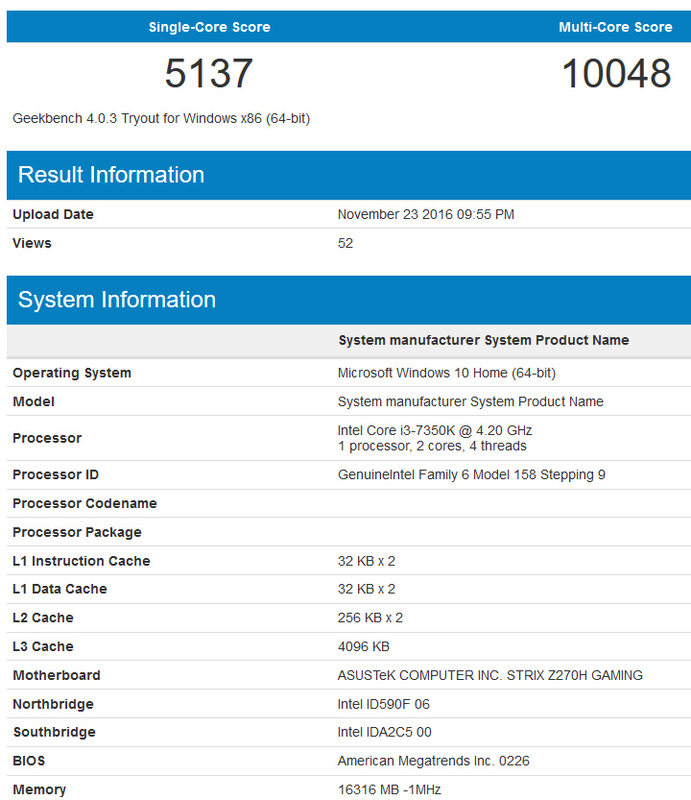 Tagged with 7350k, cpu, intel, intel I3, overclock i3, overclocking, zen.